Okay folks, we have a winner in the recent "identify the floor" contest. Apparently this guy from Mountain View, California is a true connoisseur of barroom floors, as he readily identified this floor from the Rose Room in Downtown Pendroy. 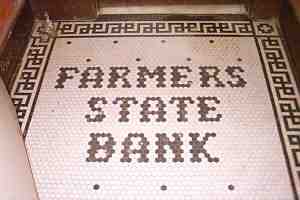 You did all know that it used to be the Farmers State Bank of Pendroy, didn't you? And did you realize that this fine establishment is currently for sale? No? Check out this listing.